If you’re looking for dog artists to paint a beautiful dog portrait of your furry friend then you’ve certainly come to the right place! 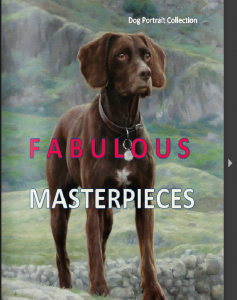 Fabulous Masterpieces is now in it’s fifth year and when it comes to portraits, apart from oil portraits of children, dog paintings are one of the most popular subjects we’re asked to paint. I personally think this is down to the skill of our dog artists, whom (and I realise I’m biased) are fantastic. To see how easy it is to commission a portrait of your dog, I’ve made a quick video to show you. After watching the video, I hope you see not only how easy it is to commission a portrait of your dog but the quality and skill of our dog artists. Dog portraits start from just £250 and world-wide delivery is free. 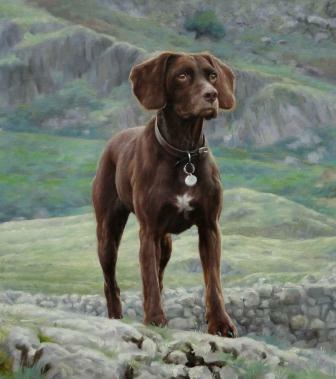 The portrait will of course be painted with premium Winsor & Newton oils onto a heavy grade duck cotton canvas. Please allow between 4 -5 weeks to receive your dog portrait as the oils do take a while to dry before we can safely deliver your beautiful painting to you. We’d love to hear from you! To ask a question or to commission a portrait please email: portraits@fabulousmasterpieces.co.uk or leave a comment. To view more examples of our dog portraits please click here and if you’d like to learn more about Fabulous Masterpieces, please click on the About us page. 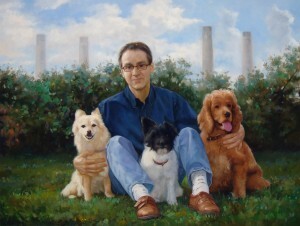 We’re a portrait company called Fabulous Masterpieces that concentrates on painting top quality portraits. We’ve even produced a dog portraits magazine, just click on the image above to take a look at more portraits our dog artists have painted. We’re based in London UK but we deliver world-wide. Good dog portrait, very beautiful!